May The Force (of Static Electricity) Be with You! A Race to the Moon against the Baron! Her Majesty's Extraordinary Adventurers are back, and this time the sky's the limit - literally. Prussia's Baron von Vaderstein has discovered a working alien spaceship buried at the base of the Giza pyramids and has used it to launch himself on a journey to the vessel's ancient point of origin - the Moon! The Adventurers have uncovered a spaceship of their own, a twin to the first in every way, but its functions are a mystery to the Adventurers. 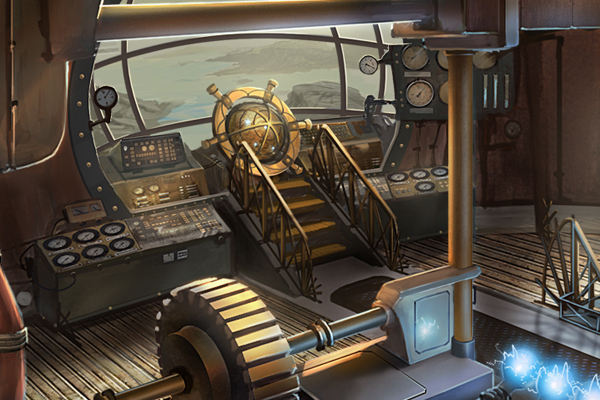 Can they learn the mathematical and logical principles of the ship's marvelous alien Mechabrain to undertake their own voyage? If so, can they catch up to the Baron, or perhaps even beat him to the Moon? And what awaits them all when they reach the ships' ancient Lunar home? Interested in joining the adventure of a lifetime and putting your mathematical and logical talents toward the quest for the Moon? See what our Partners have to say about this program and others in our Testimonials. Please Note: Presentation and materials are for showcase purposes only and not meant to be used without explicit permission. A sample of my ever growing artifacts-in-computing collection that are part of the program. Click on any photo to learn more about a device. Use the arrows at the left and right to move to different photos or simply allow the photos to scroll automatically. Duration: 2.0 hour basic program -OR- 3.0 hour full program | Age Range: 9-Adult/Senior | Participants: 10-30 | Cost: Starting at $249 for 2 hours ; $269 for 3 hours | Requirements: Video Projector with HDMI port and speakers ; Document Camera with light, rotate, and zoom ; 1 large table for presenter's items ; 10 medium tables with 4 chairs each for hands-on stations ; 1.0 hour setup and breakdown times ; additional travel charges may apply. Contact for details. Look into the Funding Options to help bring STEMpunk programming to your school or organization.